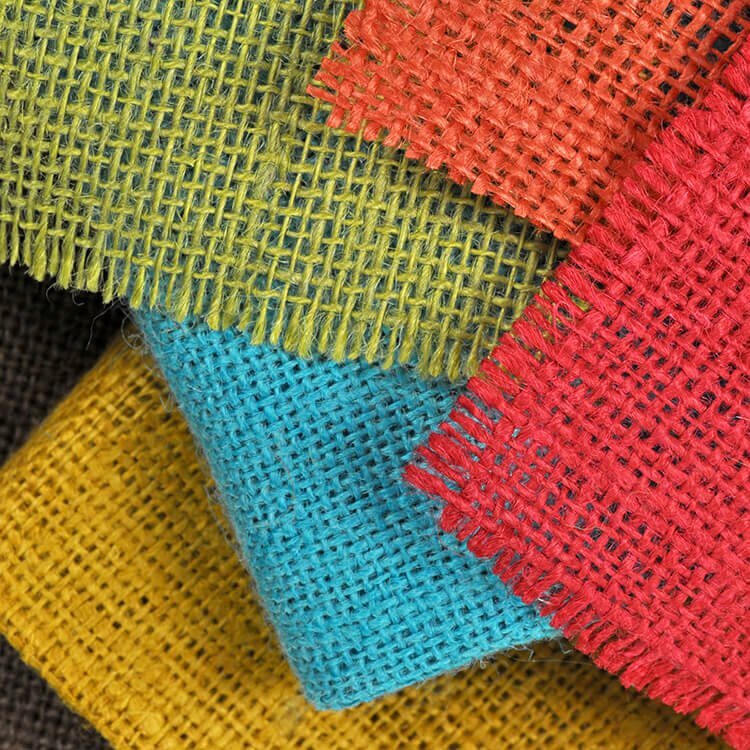 Color burlap fabric comes in a range of colors that bring brightness and boldness to a project. It can sometimes be used for practical purposes like gardening and landscaping, but is more often used for craft and decor projects like window treatments and tote bags. Shalimar and sultana burlap is available in a variety of solid colors, and you can also find color burlap in printed and metallic. Sultana burlap is a tightly woven heavy weight (11 oz) burlap with a soft finish. Shalimar burlap is similar to sultana, but has a looser weave and rougher texture. It’s also a little lighter at 8.5 ounces. Both Shalimar and sultana burlap is dyed, finished, and sanitized to remove oils and odors. You may also come across other color burlap in metallic and printed varieties. We used plaid burlap to make this decorative fall wreath. Our selection of color jute products also includes colorful burlap ribbon, jute webbing, and jute twine. For more information on color burlap and other types of burlap, see our guides on Burlap Fabric and Burlap Bags. Burlap fabric should be hand washed with cold water and a small amount of gentle detergent. It shouldn’t be left in water to soak, rinse it out and dry between two towels on a flat surface. To remove stains, blot the fabric with a damp sponge and dry with a towel. When sewing burlap, it helps to use a short stitch length. Since the edges can fray a lot, you may want to finish the edges with a zigzag stitch. Click here for more info on sewing with burlap fabric. Check out our selection of color burlap fabric. I need a roll each of red, orange yellow green and purple, do you jave this a available?